Unfamiliar faces can look very different on different photos. The pictures below show only two persons, and for most people it is quite hard to see which image belongs to which person. This task, however, would be trivial if the two people were highly familiar to you, e.g., good friends or relatives. The main problem with unfamiliar face recognition is that we are not able to see what is common in all the different images of the same person, because “superficial” characteristics of pictures (lighting, viewing angle, emotional expression, hairstyle etc.) vary substantially. This makes it hard to tell faces together (see e.g., Jenkins et al., 2011). Importantly, if we learn to recognize new faces, we need to learn about this variability, or, in other words, about the possible ways a person can look in different images. Andrews and colleagues (2015) have shown that a sorting task with images such as those shown above can be used for face learning. Participants are presented with multiple cards depicting the faces of two different identities and are requested to sort these cards into two piles, one for each identity. During this task, the participants learn both the information common to all images of a specific facial identity (i.e., image-invariant information) but also about the possible variability. This type of learning results in a so-called “robust” or “stable” representation, which in turn allows the identification of the newly-learnt face even from completely novel images. In a recent ERP study (Andrews et al., 2017), we have shown that the neural correlates of these newly-established stable representations can be found directly following the above-described face sorting task. After sorting, we recorded our participants’ EEG and presented the images used during card sorting (seen-in-sort-sIMG), multiple new images of the same identities (seen-in-sort-dIMG), multiple images of two unfamiliar faces (new-to-ERP), and multiple images of two celebrities (famous). As can be seen in the figure below, the brain can discriminate between unfamiliar and highly familiar (famous) faces within approximately 200 ms (i.e., the famous condition is relatively more negative than the new-to-ERP condition from that time on). 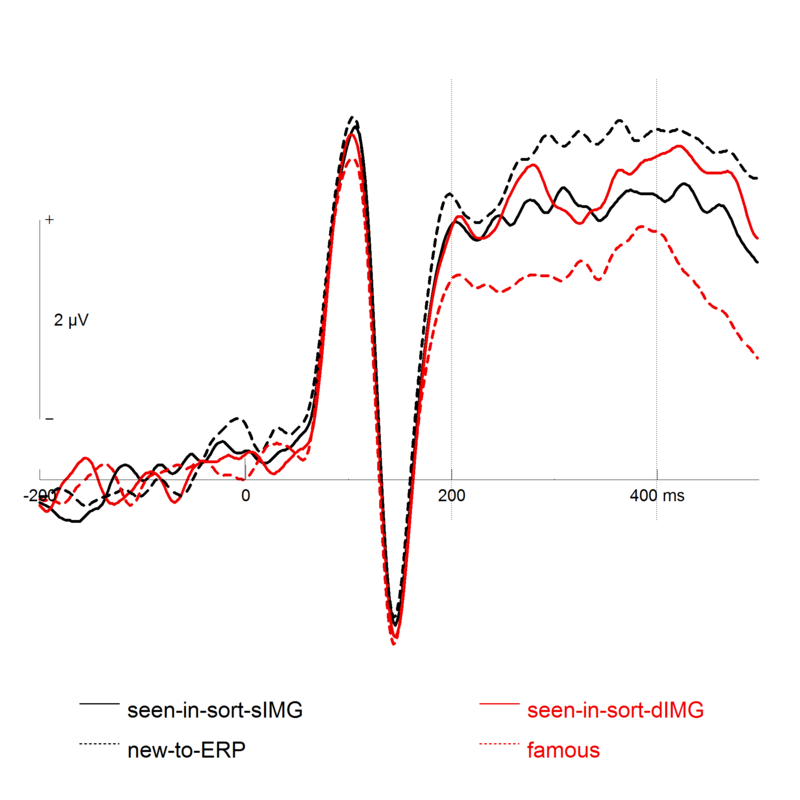 ERPs to newly learnt faces also differed from those for unfamiliar faces in a slightly later time window (i.e., seen-in-sort-sIMG and seen-in-sort-dIMG conditions are relatively more negative than the new-to-ERP condition from approximately 280 ms on). 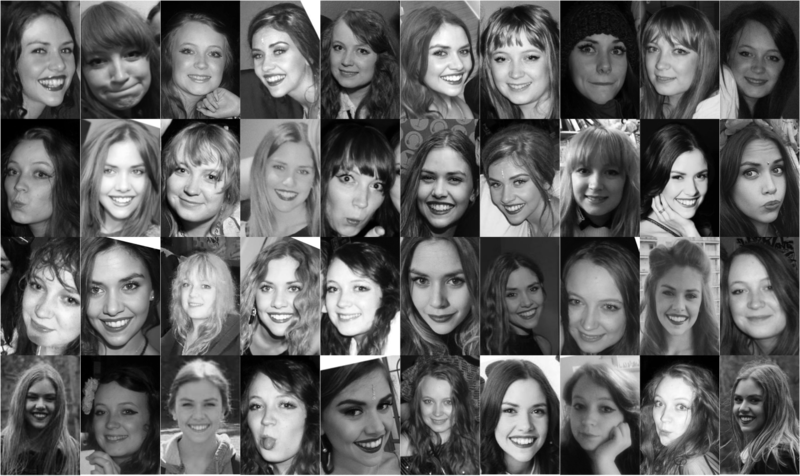 This finding represents a neural correlate of the recognition of these newly-learnt faces. Importantly, the ERP response was not different for same-image and different-image conditions, indicating that the new faces were also recognized from novel, never-before seen images, which is the hallmark of familiar face recognition. These findings indicate that people are able to quickly learn new faces if they are presented with sufficient variability, and that this learning effect can be demonstrated in neural responses directly after learning. ERPs further suggest that newly formed stable representations are accessed within roughly 280 ms.